In my early years in the church, back in the 80s, when people meet me, they would asked and say "you look like a nice person, why did you joined the controversial Unification Church and love Rev. Moon so much, what is he giving you?" 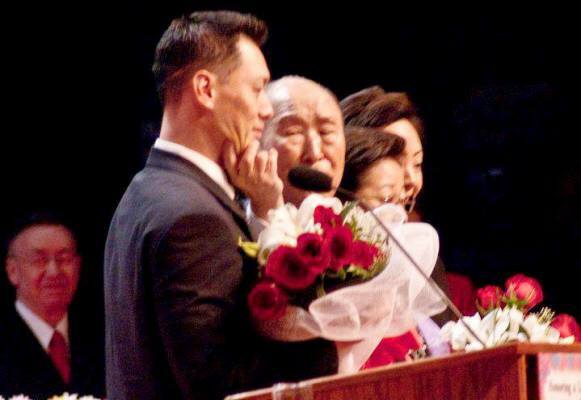 ...People have no idea what caused Unification Church members to scrifice their life and their careers to love and support Rev. Moon and his church. Perhaps, the following dream titled "A photo stored in Heave", published in my book, Honor Thy God, could express my love for Rev. Moon and for why I joined his church. In the dream, I dreamt I entered a large office building and I was led to a staircase going down to the lower level. As I got to the last step, then suddenly to my right a huge ballroom appeared with wide open doors. I walked in and to my surprise the room was packed with people worshiping together. There were so many groups and they seemed to pray in different styles in unison. Some groups were bowing like Muslims do, some were kneeling like Catholics do, others were standing, and other groups were holding their worship service like Hindus do. Also, some were standing in a circle, some were facing East, some were facing West and others were facing North. I was amazed by how huge the ballroom was; it seemed to open to an outdoor space that had no end. I was fascinated by the multitude of people worshiping together in all different forms. I was a little confused as to what manner I should pray, so I said a little prayer and walked out of the ballroom. As I exited this huge room I noticed the presence of another room right opposite and heard laughter and people talking. The doors were wide open; and so out of curiosity I entered the room and, there to my surprise I found a small gathering of about 100 Unification Church leaders meeting with Reverend Moon. At the far end of the room was Colonel Bo Hi Pak (one of Reverend Moon's closest disciples and a translator) sitting at a small round table with a huge book that looked like a registry book in front of him. Father Moon was standing next to Colonel Pak and had a round tray with a large ancient Asian, but unusually decorated, teapot -- the like of which I had never seen -- that had a special and very significant drink, called something like "Juice" or "Water of Life" which Father Moon was distributing to the people around him. While this was transpiring, I was consumed with thoughts; thinking how could they do this, letting Father Moon do the work and these leaders, particularly Colonel Pak, who was sitting there and doing nothing. While I was standing in the back of the room observing everything and still thinking, suddenly Father Moon made a joke during a comment, and beaming with a big smile on his face, walked fast towards the back of the room to a group of men who were standing close to me. His right hand was in the air as if he was to smack someone, like he usually does during his speeches and which lucky members will treasure for life. As Father Moon was coming fast, aiming to hit one in the group who stood next to me, I wished that Father Moon's hand would land on me. And to my amazed and excited surprise, Father Moon cut through the small crowd of leaders and came straight toward me -- and his hand did land on me! And with all my heart- felt love and emotion, I wrapped myself around Father Moon, hugging, kissing and crying without ever wanting to let go! Father Moon, likewise, was holding me tight and not letting me go. We stood holding each other in a tight grip for a long period of time and it appeared that we were both getting a little tired standing and that we needed to sit down. At this time the whole group of church members were standing around us, watching and marveling. With Father Moon not wanting to let go of me first and my not wanting to let go of him first, we sidled over to a wall that stood about fifty feet away, side by side, still tightly holding each other. And as we were sidling towards the wall I felt hot tears running on my arms that were pouring out of Father Moon's eyes. When we got to the wall, we put our backs against the wall, we slid down and sat, still holding each other in the same position. As we sat down, all members were gathered around us, cheering and clapping and Father Moon's photographer came and took an official photo of us holding each other -- with bright lights and puff sounds as the photographer pressed the camera button. The camera puff sounds and the floodlight flash gave the signal of assurance which enhanced the photo quality and authenticity. The End. I truly believe that this photo with Father Moon is stored in Heaven!